2 Day IKO BeginnerIKO Level 2 Intermediate3 Day Course + Harness4 Weekend Fast TrackFreedom 16 Course5 Day Kitesurf Camp3 Day Boardstart CourseIKO Assistant InstructorPersonal TuitionWhich Course to go for? Kitesurfing Lessons taught by IKO Instructors. Get ready to Ride! Kitesurfing Lessons run by Steve Jones IKO Level 2 Senior Kitesurfing Instructor with 9 years teaching experience. 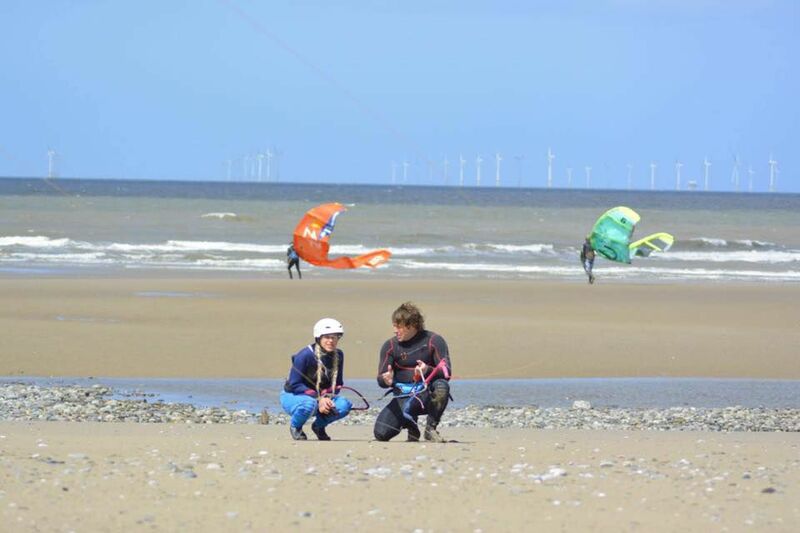 We are based in Kinmel Bay where there are miles of quiet Beach, North Wales Kitesurfing is the perfect place to take your 2 Day IKO Level 1 and Level 2 Kitesurfing Lessons which are running throughout the season up to the end of November. We also offer Personal kitesurfing lessons, Kite and Board hire, IKO Level 2 Kitesurfing Lessons, and Kitesurfing School Holidays. We use the new 2017 North Kiteboarding Kites for teaching, with North Jaime Pro and North Crossride Kiteboards. Our Instructors are insured and IKO qualified to teach, and we have permission and the License to teach kitesurfing on Kinmel Bay Beach from Conwy Bourough County Council. We also teach on Black Rock Sands in Porthmadog, the Isle Of Man, Porthcawl in South Wales. And we run Kitesurfing School Holidays to the amazing Canary Islands. We are also about to launch our Worldwide Kitesurf Instruction Service where you can take an Instructor with you to any destination. The website will be launched soon. We have a variety of courses to choose from depending on how many days you would like to spend learning with us. If you're brand new to kitesurfing the 2 day beginners IKO level 1 and 2 kitesurfing course is a great way to start. We supply all the equipment needed for your lessons except Neoprene Boots and Gloves which you will need to keep your hands and feet safe in the water. We use 2 different Beaches which help us teach in all wind directions. The wind can change so please be prepared to travel if necessary. Our next course is on the 24th and 25th of February and March 2018 . More courses throughout 2018 are ready to be booked online. If you would really like to get Kitesurfing cracked we are now running Fast Track Courses. For £450 you will get 4 weekends of tuition down on our Beach in Kinmel Bay. The first weekend will be as the 2 Day IKO Level 1 Course, then we will take your Kitesurfing skills onto new levels progressively over the next 3 weekends. This Course has set dates and you must be able to attend them. This Kitesurfing course is fantastic value for money, and we will be running them throughout the season. The first one was a great success. We have taught students how to Boardstart in 2 days, imagine how far you will get with 8 days of professional tuition. Please call if you have any questions on our courses or if you're not sure which course is for you we are more than happy to help. Call the Kite Line. The 2 day beginners IKO Level 1 and Level 2 kitesurfing courses are running every weekend and during the week upon request.